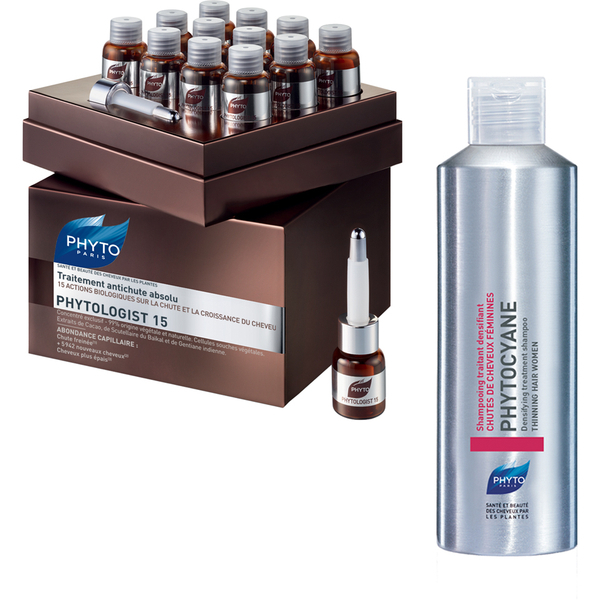 Rediscover thicker, healthier hair with Phyto's Phytologist 15 Anti-Hair Loss Treatment with Phytocyane Shampoo. The duo comprises an innovative anti-hair loss formula with a revitalising shampoo to promote healthier-looking, more luscious hair. Perfect for those craving a radiance and vitality boost. One month's supply of anti-hair loss treatment that performs 15 biologic actions to work on the loss and growth of hair. Combines 99% natural ingredients, including: Cacao extracts, which fight against micro-irritations of the scalp; Baikal skullcap, which works to generate thicker hair; Indian Gentian, which activates growth and favours the development of new hair; and Vegetable Stem Cells, which protects the scalp from external aggressors. Apply after shampooing and leave to melt into the scalp, for denser, stronger and healthier hair. A revitalising shampoo that targets hair loss and brittle nails. Its innovative formula combines botanical ingredients, including vitamin B6 and Cinchona to boost cell metabolism, improve hair's resistance and shield against free radicals. Hair feels fortified and vitality is restored. The hair bulb is protected and effects of ageing are prevented. Anti-Hair Loss Treatment: After shampooing, apply one bottle of Anti-Hair Loss Treatment on the scalp line by line, three times per week. Do not rinse. Process to the brushing. Phyto PhytoCyane Revitalising Shampoo: Apply the shampoo to wet hair. Massage gently. Rinse with plenty of water. Anti-Hair Loss Treatment: Equisetum Arvense Extract (Extraction de Prêle), Alcohol Denat. (Alcool de Betterave), Aqua/Water/Eau (Constitutive des Matières Premières), Propanediol, Glycerin, Citrus Limon (Lemon) Peel Oil (Citron), Globularia Cordifolia Callus Culture Extract, Arginine, Lactic Acid, Parfum/Fragrance, Serenoa Serrulata Fruit Extract (Serenoa Repens), Glycine Soja (Soybean) Germ Extract, Triticum Vulgare (Wheat) Germ Extract, PVP, Salvia Officinalis (Sage) Oil (Sauge), Theobroma Cacao (Cocoa) Extract, Cupressus Sempervirens Leaf/Nut/Stem Oil (Cyprès), Lentinus Edodes Extract (Shitaké), Melaleuca Leucadendron Cajaput Oil (Cajeput), Scutellaria Baicalensis Root Extract, Panthenol, Pyridoxine HCL, Rosmarinus Officinalis (Rosemary) Leaf Oil (Romarin), Swertia Chirata Extract, Maltodextrin, Cananga Odorata Flower Oil (Ylang-Ylang), Limonene, Linalool, Citral, Benzyl Benzoate, Geraniol, Benzyl Salicylate, Farnesol, Gluconolactone, Hydroxypropyl Chitosan, Sodium Benzoate, Potassium Sorbate, Dextran, Trifluoroacetyl Tripeptide-2, Calcium Gluconate.